The 2011 United States Army Commemorative Half Dollar Coin will be issued on January 31, 2011 by the United States Mint to honor the nation's oldest military branch. Also issued in connection with this strike will be an Army $5 Gold Coin as well as an Army Silver Dollar Coin. All three will be struck in both proof and uncirculated condition and were authorized by the United States Army Commemorative Coin Act of 2008 (Public Law 110-450). Up to 750,000 of these clad half dollar coins will be struck with surcharges of $5 per strike to be forwarded to the Army Historical Foundation to support the construction of the National Museum of the United States Army at Fort Belvoir, Virginia. The obverse of the coin depicts the United States Army with a theme of "Service in Peace" by showing a U.S. Army soldier surveying along with two servicemen building a flood wall and a Redstone Army rocket which was used during early space exploration. 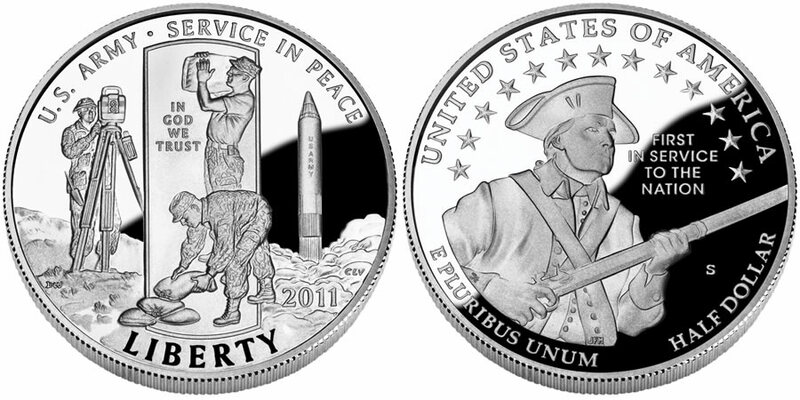 The obverse was designed by AIP Master Designer Donna Weaver and sculpted by United States Mint Sculptor-Engraver Charles L. Vickers and also includes the inscriptions of "U.S. ARMY," "SERVICE IN PEACE," "IN GOD WE TRUST," "2011" and "LIBERTY." The reverse contains a design symbolizing the US Army as the first military service to defend the country, as it did during the American Revolutionary War. It does show by depicting an enlisted Continental soldier armed with a musket along with the inscriptions of "UNITED STATES OF AMERICA," "FIRST IN SERVICE TO THE NATION," "E PLURIBUS UNUM" and "HALF DOLLAR." It was designed by AIP Master Designer Thomas Cleveland and sculpted by United States Mint Sculptor-Engraver Joseph Menna.